Shell Alaska yesterday began drilling operations at its Burger prospect in the Chukchi Sea, offshore Alaska. 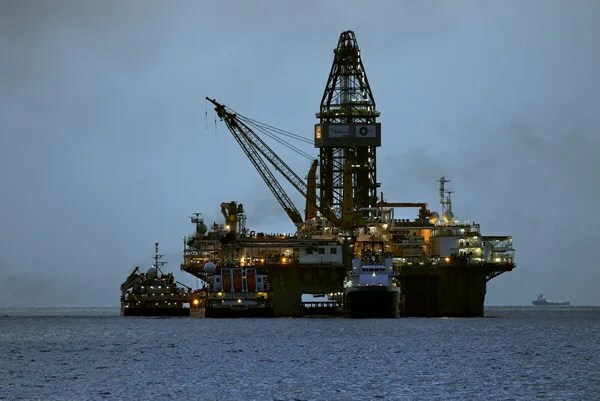 The Noble Discoverer drillship is being used for the operations. “The occasion is historic. It’s the first time a drill bit has touched the sea floor in the U.S. Chukchi Sea in more than two decades. Today marks the culmination of Shell’s six-year effort to explore for potentially significant oil and gas reserves, which are believed to lie under Alaska’s Outer Continental Shelf. In the days to come, drilling will continue in the Chukchi Sea, and we will prepare for drilling to commence in the Beaufort Sea,” said the company in a press release. 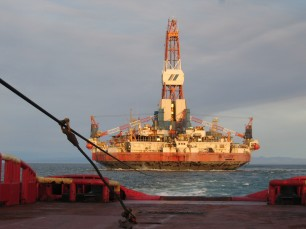 VIDEO: Shell Starts Drilling in Chukchi Sea, Alaska| Offshore Energy Today. Today, the Senate has two hearings scheduled on the Law of the Sea Treaty (LOST). The Senate will have had three hearings on the LOST after today—yet, not for the purposes of educating Senators on the flaws versus the benefits of the treaty. These hearings are a pretext for a lame duck strategy to railroad the treaty through the Senate after the November election. The first hearing today is titled “Perspectives from the U.S. Military.” Witnesses include Admiral James A. Winnefeld, Jr, Vice Chairman of the Joint Chiefs of Staff, and representatives from other government stakeholders in navigation on the high seas. The question that these witnesses can’t sufficiently answer is, “What can’t you do today, because of the LOST, that you could do if the treaty were to be ratified?” The answer is nothing. Heritage’s Kim Holmes, former Assistant Secretary of State for International Organization Affairs, wrote for The Washington Times last year that the navigational provisions in the treaty are not necessary. The treaty’s navigational provisions offer nothing new. Yes, the U.S. Navy says (LOST) might improve the “predictability” of these rights, but does the Navy’s access to international waters really depend upon a treaty to which we are not even a member? The last time I checked, the U.S. Navy could go anywhere it wanted in international waters. Though redundant, the navigational provisions of (LOST) are actually pretty good. That’s why President Ronald Reagan supported them. But Reagan and others objected to the unaccountable international bureaucracy created by the treaty. The second hearing today will include former Secretary of Defense Donald Rumsfeld, Heritage Foundation expert Steve Groves, former Deputy Secretary of State John Negroponte, and former Legal Advisor at State John B. Bellinger, III. This hearing will be an excellent opportunity for the opponents of LOST to make the case that this treaty is flawed. The bottom line is that Senator John Kerry (D–MA) has been stacking hearings in favor of proponents of LOST. The first hearing this year included Secretary of State Hillary Clinton, Secretary of Defense Leon Panetta, and General Martin Dempsey, Chairman of the Joint Chiefs of Staff. As I wrote in an op-ed at Townhall, opponents of the treaty made a strong case against ratification. Sen. Bob Corker (R-Tenn.) professed to be starting from a neutral position vis a vis ratification. Directing a query to Ms. Clinton, he said, “A lot of people believe that the administration…wants to use this treaty as a way to get America into a regime relating to carbon, since it has been unsuccessful doing so domestically. And I wonder if you might respond to that.” Ms. Clinton’s response? She said she has a legal analysis that knocks down that argument. But not all Americans are willing to rely on a politically driven legal memo from the Obama Administration as a guarantee that this treaty will not empower the International Sea Bed Authority to force regulations on American business. Those seeking certainty on this vital issue would rather take a pass on the treaty than take a chance on Ms. Clinton’s promises. Senators Mike Lee (R–UT) and Jim Risch (R–ID) expressed dissatisfaction with the Administration’s alleging that opponents of the treaty were engaging in “misinformation” and “mythology.” Risch argued that “you addressed the people who oppose ratification of the treaty, and…I hope you weren’t scoffing at us.” Proponents have engaged in name calling to avoid the central issues to be considered before ratification. These hearings are intended to show that Senate Foreign Relations Committee Chairman Kerry allowed conservatives to have their say before the lame duck strategy is implemented. The deck has been stacked, with two hearings in favor and one with a 50–50 split between proponents and opponents. Kerry used a similar strategy the last time the Senate considered the LOST. Make no mistake; these hearings are part of the strategy of the treaty’s proponents to wait until after the election to push through LOST—in November or December of this year when the American people have no recourse against this offense against American sovereignty. The Bureau of Ocean Energy Management (BOEM) announced yesterday that it was seeking public input on issues that should be tackled by the bureau in preparing an Environmental Assessment for proposed seismic data acquisition activity in Arctic areas of the Alaska Outer Continental Shelf (OCS). ION Geophysical Corporation has applied to conduct an exploratory 2D marine seismic survey during the fall of 2012. The application proposes conducting operations throughout much of the Beaufort Sea Planning Area, with specific transect lines and segments within the Chukchi Sea Planning Area. Data obtained during this survey would be used by geologists and geophysicists to view and interpret large-scale subsurface geologic structural features and evaluate prospects for oil and gas reserves. The Bureau of Ocean Energy Management (BOEM), an agency under the United States Department of the Interior that manages the exploration and development of the nation’s offshore resources, has also on its website announced ION’s permit application #12-01 and the associated area coverage map. BOEM has also explained the the procedures required for submission of comments, setting the deadline for April 30, 2012. More information can be found at BOEM’s official website. Top of the world tactics at ION. See the ION approach in action as Joe Gagliardi, Director Arctic Technology & Solutions, tackles the punishing Arctic environment. By combining the capabilities across the company, ION delivers the answers and the technology that allows operators to acquire data further north than ever before and dramatically extends the short working season. The American Bureau of Shipping (ABS) has announced it will class the first-of-its-kind Arctic Containment System (ACS), which will serve all exploration activities in the Chukchi and Beaufort seas offshore Alaska. 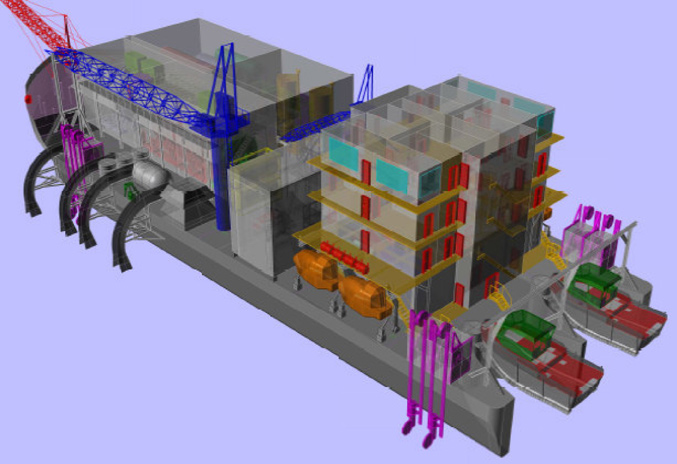 The ACS will be deployed in June 2012. ABS explains that a modular oil containment system will be installed on the deck of the non self-propelled ice-strengthened barge following its conversion to a floating offshore installation The dedicated barge will remain unmanned and on standby until deployed. Then, assisted by a tugboat, its trained crew will be able to respond to an oil spill incident in the exploration areas in a matter of days. Shell has plans to drill up to six exploration wells off the coast of Alaska, later this year and has contracted with Superior Energy, the operator of the ACS, for the containment system to be available during the summer drilling season. The containment system would be able to mitigate spillage in the time it takes to drill an intervention well. The oil giant’s Arctic drilling plans have been facing strong opposition from environmental activists. Today, twenty Greenpeace activists boarded two icebreakers leased by Shell from Finland’s Arctia Offshore. Shell has leased the vessels to support its upcoming drilling operations offshore Alaska. 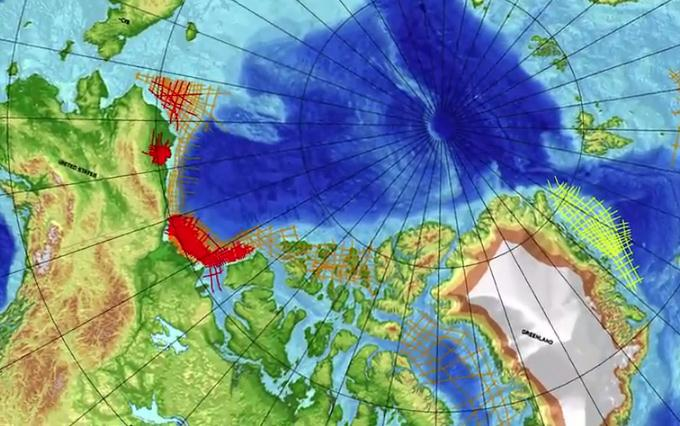 Alaska’s North Slope shales may hold as much as 80 trillion cubic feet of gas, or more than half the highest estimate for the Marcellus formation, and as much as 2 billion barrels of oil, the U.S. Geological Survey said. President Barack Obama’s administration and the state of Alaska are offering more access to oil and natural gas resources on land and in the Arctic waters to help lower dependence on imported fuel and push more crude through a major oil pipeline crossing the state. Royal Dutch Shell Plc plans to start drilling this year in the Chukchi and Beaufort seas, which are off the coast of the North Slope. “Alaska’s energy resources hold great promise and economic opportunity for the American people,” Interior Secretary Ken Salazar said today in an e-mailed statement. The geological service, part of the Interior Department, said in a statement that North Slope shale hasn’t been developed because of economic and infrastructure considerations. The assessment, the first made of North Slope shale resources, is based on success in extracting oil and gas from similar formations, such as the Marcellus Shale in the U.S. East. The agency last year estimated Marcellus may hold as much as 144 trillion cubic feet of gas. Shale gas and shale oil, produced by horizontal drilling and hydraulic fracturing by injecting water and chemicals underground, led to record natural gas output in the U.S. last year and 33 percent decline in prices in the past 12 months.